From hardware issues (like replacing a bad LCD Display or resolving a power problem) to software problems (installing new operating system or remove a virus from your laptop), Long Island Computer Repair is your professional laptop service provider. We provide virus removal, computer repair, updates, upgrades. Home and Small Office-Home Office network services throughout Suffolk and Nassau Counties in Long Island - New York. excellent work... Sam went above and beyond to fix me up and get me back to work. fast, prompt and they do what they promise they will do! Why Long Island Computer Repair? Providing virus removal, computer repair, upgrades for Home and Small Office network services throughout Suffolk and Nassau Counties in Long Island - NY. 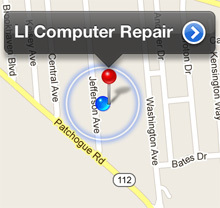 Copyright © 2009 Long Island Computer Repair. All Rights Reserved. Designed by suwebdesign.com.